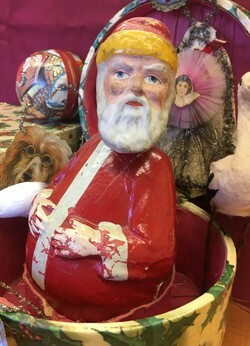 Antique ornaments, decorations, dolls and toys from days gone by will be featured in a vintage Christmas display showing at Cole Art Center Dec. 1 through Dec. 30. NACOGDOCHES, Texas - The Cole Art Center @ The Old Opera House will host a holiday exhibition that provides a glimpse into the celebrations of Christmas from bygone eras. The Christmas display, which shows Dec. 1 through Dec. 30, includes vintage and antique ornaments, decorations, dolls and toys from days gone by. The vignette will offer a glimpse into how this favorite holiday was celebrated 100 years ago, according to John Handley, director of art galleries for Stephen F. Austin State University. "This will be the third year we have featured a vignette in the center of the Ledbetter Gallery at the Cole Art Center," Handley said. "Several museums around the United States put up holiday displays as a family-friendly feature. The Taft Museum in Cincinnati does a series of elaborate displays each December, highlighting the artistry and history of Christmas celebrations from a century ago." Mike Moore with the Nacogdoches Public Library will present family-friendly Christmas stories at 2 p.m. Sunday, Dec. 9, with some simple craft projects to follow. Sponsors for the display are The Flower Shop, SFA Friends of the Visual Arts, William Arscott and Nacogdoches Junior Forum. Admission to exhibitions is free. SFA School of Art's historic downtown gallery, The Cole Art Center is located at 329 E. Main St. For more information, call (936) 468-1131.